Vladimir Putin’s “turn to the East” (povorot na Vostok) greatly intensified in 2014. Of the various pivots to Asia it is one of the most controversial, but, at various times, was encouraged by all countries active in the region. Compared to the others, it has the most diversified objectives, but also the greatest contradictions among them. In the context of multiple pivots, this one has the greatest urgency and, perhaps, the most immediate ramifications. To appreciate its significance, we need to grasp not only its stated objectives, but also the intended impact on bilateral relations with the other states in Northeast Asia and likely fallout from clashes with other pivots. Russia’s “departure from Europe and entrance into Asia”—a reversal of the slogan used in Japan in the late 19th century—has the following objectives: 1) civilizational, to clarify that Russia rejects the “universal values” of the West and insists on its own distinctive civilization, which is shared through “Eurasianism”; 2) geopolitical, to forge a multilateral security framework, which stands in contrast to the US-centered alliance system: and 3) geo-economic, to become an integral part of Asia’s dynamic economy, developing the Russian Far East and Eastern Siberia as a manufacturing hub, transforming its transportation infrastructure to realize Eurasianism, and also supplying energy primarily to Asia rather than to European states. The gateway to Asia for all three of these objectives is China, with which relations, geographically, must cover the Asia-Pacific region or the maritime zone; cross-border areas or the eastern zone; and Central Asia with extensions to South and Southwest Asia or the western zone. Other countries in Asia—North Korea, South Korea, India, Japan, and Vietnam, topping the list—are often viewed through a triangular prism with China. Within Russia the overall direction of the “turn to the East” has deviated from what many expected before the spring of 2014, and business interests are raising doubts about overdependence on China. The battle lines in the fall of 2014 are between the Putin-led establishment, which insists that everything is going smoothly in Russia’s full-scale reorientation to Asia, and the rare voices raising concerns—not about the general wisdom of Putin’s leadership in this process, but about overdependence on China as an economic strategy. The mainstream refuses to acknowledge tradeoffs, which are discussed below, which are needed if the current strategy long persists. As long as there remains optimism that Abe Shinzo is eager for a breakthrough and Park Geun-hye will also defy Obama’s pressure over Ukraine, Russians are reluctant to reconcile insistence that a new cold war is taking shape in East Asia as elsewhere with their predictions that multipolarity involving US allies is also within its reach. The United States long encouraged Russia to turn its attention to the Asia-Pacific region and to modernization of the Russian Far East. It was assumed that national interests overlap most fully in this vector of Russian interest. Whereas to the west tensions existed over NATO and EU expansion and to the south Russians worried about friendly dictatorships being undermined by NGOs and “color revolutions,” the Russian Far East and the Korean Peninsula appeared to be ideal environments for multilateral cooperation.1 US allies, Japan, and South Korea, were considered to be positive influences, whose partnership would steer Russia toward integration into the global economy based on market principles and support for regional stability without leaning heavily on China or reverting to close ties with North Korea. The greatest needs were: openness, after more than a half century of closing the area, including Vladivostok, to the outside world; capital, to develop a cornucopia of natural resources, especially oil and gas; and diverse foreign partners, in order to avoid one-sided dependence on China with its vast population of potential migrants and longstanding resentment over the “humiliation” of territorial losses to Russia. Both economic complementarity and balance of power favored the interests of the United States, it was assumed. As recently as 2010-2011 when Russia was planning for the Vladivostok APEC summit—seen as boosting integration into the Asia-Pacific region guided by Dmitry Medvedev’s “modernization” ideals—, many thought that its regional initiatives would breathe increased life into the Russo-US relationship. South Korea has long been depicted as deeply interested in triangular cooperation with Russia and North Korea as well as in investment in the Russian Far East. There was often a lack of candor in Russia about its reasons for caution and its inclination to give Russia hope in order to sustain cooperation in trying to change North Korea, but Park Geun-hye’s Eurasian initiative led to further optimism about her country’s encouragement of Russia being welcomed as it expands its openness to East Asia In Vladimir Putin’s November 2013 visit to Seoul, this theme drew wide attention. The ideal Russian “turn to Asia,” which was repeated as if it were within reach over many years, now seems to have been sacrificed in the sharp tilt to China and away from the United States. It had at least six components. First, it secured multipolarity by developing the Russian Far East and Eastern Siberia as a manufacturing hub not just a natural resource supplier, by building up the coastal area with access to many markets; limiting Chinese investments in most non-manufacturing pursuits through informal controls; limiting Chinese traders and migrants to the point of insisting on others filling the urgent needs in preparing for the Vladivostok APEC summit; and investing heavily in this region to attract migrants from various parts of Russia and make it a beacon of development under its own economic tsar able to cut through red tape. The global financial crisis in 2009, the slowdown in the economy of Russia in 2013, and the sanctions by the West in the spring of 2014 led to throwing caution to the wind on all of these points, raising the grave risk of Chinese monopoly power. Second, Russia sought to use the SCO and other institutional and bilateral linkages to Central Asia to control China’s presence in Central Asia, keeping the countries of this region primarily in Russia’s orbit. 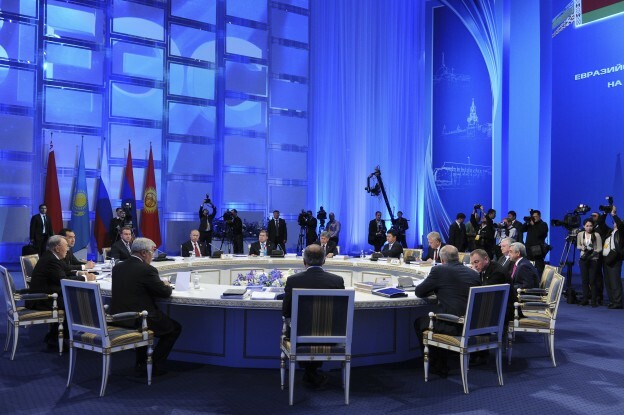 Moscow blocked an FTA and other economic integration through the SCO. It tried to monopolize security in the region through the CSTO and bilateral arrangements, limiting China’s role to counterterrorism in opposition to Islamic separatists. Culturally, elites were assumed to be Russianized and efforts were made to keep this orientation. Finally, financial, energy, and other infrastructure was to remain dependent on Russia. When the Eurasian (Economic) Union was announced in 2011-2012, many assumed that it would be a counterweight to China’s growing presence in Central Asia. In 2014, Russia bowed to new realities by agreeing that Xi’s Silk Road Economic Belt and Putin’s Eurasian Union are joining together and Central Asia is becoming part of a larger framework, not as solely the bailiwick of Russia. Long-expressed reservations about China’s role there had faded. Third, the myth of a “troika” of continental behemoths—Russia, India, and China—, in which Russia enjoyed the pivotal position, was exploded as Russian-Indian ties lost even a semblance of special closeness and Sino-Russian relations intensified. As India became more strategic in its thinking and more pragmatic in expanding ties of economic advantage, Russia’s relevance declined. This was quietly acknowledged in the far scantier references to India in Russian commentaries about turning to Asia. Fourth, the United States stopped being included in discussions of Russia’s pursuit of multipolarity in Asia. The notion of Asia-Pacific regionalism had been replaced by the theme of Eurasianism. Somehow other states in Asia would have to suffice for providing the necessary balance of economic ties and power. In apparently echoing Xi’s 2014 call of “Asia for the Asians,” with the twist of including Eurasians, Russia was leaving itself vulnerable—economically, geopolitically, and even culturally. With Northeast Asia its primary concern, Russia had long maintained the pretense of promising relations with South Korea expected to pay big economic dividends. It had raised the profile of Japan after its 3/11 tsunami and especially after Putin and Abe announced their joint effort for a breakthrough in relations. The two developed economies represented a kind of reassurance that balance in the region and large-scale investment were within reach, but in the fall of 2014, supposedly due to new pressure from the United States, continued talk of megaprojects funded by either of these states seemed illusionary. This dealt a fifth blow to Russia’s optimistic claims. Finally, the November 2014 EAS revealed Russia’s marginal place in Southeast Asia. After once heralding Russia’s inclusion in the EAS and its strong ties to ASEAN, Putin did not even bother to attend the gathering between his stops at APEC in Beijing and the G20 in Brisbane. Instead, increasingly dire reports of Russian troop movements into Ukraine cast a shadow on the assembly. While observers were still mentioning Russia’s special relationship with Vietnam, especially arms sales, in defiance of China, the idea of balancing China in this way was absent from Russian publications. The “turn to the East” has been subject to diverse geographical interpretations. At one end of the spectrum is the view that it is a broadly oriented refocusing away from Europe to Asia as a whole—no longer with emphasis on the Asia-Pacific region. This includes South Korea and Japan, which value improved ties to Russia despite US pressure. It involves Southeast Asia, the countries of which has been encouraged to boost exports of agricultural goods to fill the hole left by countersanctions aimed at the West. A sharp contrast is drawn between the anti-Russian West and the states of Asia, which are only seeking economic cooperation and regional stability. At the other extreme is the argument that not only is the “turn to Asia” concentrated on China, which is a full-fledged partner unlike many other states in the region, but that North Korea is second on the list of partners, as an enemy of the United States, Russia’s principal opponent. Closing ranks with another country subject to unfair treatment by the United States is, we are told, an appropriate step in containing US aggression.4 The ideal path to regionalism is now replaced with what is regarded as the necessary path, with blame centered on US containment and pressure on allies. On November 10, 2014, at the APEC summit in Beijing, Putin explained his thinking on economic regionalism, stressing three points: the importance of bilateral Sino-Russian relations, the linkage between his Eurasian Economic Union and China’s plans for the Silk Road Economic Belt and an FTA of the Asia-Pacific, and the need for the Russian Far East to become a manufacturing hub for the Asia-Pacific region. Given the recent free-fall in the ruble and rapid increase in capital flight from Russia, Putin’s speech to the assembled CEOS first had to offer reassurance that his country is a stable and reliable partner. On Russia’s relations with China, agreement to build a second western gas pipeline after the USD 400 billion deal announced in May for an eastern gas pipeline showcased continued momentum. Putin announced too that the two countries had started implementing their agreement to use national currencies in economic transactions. In the face of avoidant relations with Barack Obama and Australia’s Tony Abbott and global speculation about the state of Russia’s economy, Putin made his meeting with Xi and talk to the CEOS centerpieces of his Beijing visit. The main arguments he made in his speech were that opportunities abound for new investment in Russia, especially in manufacturing in the Russian Far East, and that Russia’s plan for the Eurasian Economic Union, including Kazakhstan, is compatible with China’s proposal for an FTA of the Asia Pacific. In Beijing and a week later at the G20 in Brisbane, Putin was the most divisive figure, pressing Russia’s own pivot. Toloraya points to an upsurge in contacts with North Korea in 2014, beginning with Kim Yong-nam, the nominal head of state, attending the Sochi Olympics, at which Park Geun-hye was conspicuously absent. The high point came in October when the North Korean foreign minister visited Russia for 11 days, including travel to four regions in the Russian Far East. Already Russia’s FDI through the Rajin-Khasan line is the largest foreign investment and Russia has been exporting coal. By year’s end, the Rajin terminal will be used to send transit shipments onward to Pohang in South Korea, Russians anticipate. When Foreign Minister Ri Su Yong met with officials in Russia, he stressed projects aimed at increased production rather than assistance. Following forgiveness of the North’s USD 11 billion debt, apart from about USD 1 billion to be put in a fund for humanitarian and energy projects, Russia has insisted that the North must pay for purchases and investments with such items as coal, rare earth elements, and other minerals. The North is seeking long-term bilateral agricultural projects, as well as investments in infrastructure such as for transportation. This leaves room for Russia to buy coal and sell it in the international market, assisting in modernizing the North’s mineral industry, while playing an active role in building new roads and modernizing railroad line and investing in special economic zones. If Russia’s plans exceed its financial resources, hope turns to South Korean investors. Russian sources recognize that China is not interested in recreating a Cold War atmosphere with the West, but they argue that it views the sanctions imposed on Russia as aimed at holding back its development, much as the sanctions against China in 1989 were intended. It also agrees that Ukraine is an example of a “color revolution” and made clear to Russia in the spring that it would work to nullify the effect of the sanctions. At the same time, China is seen as welcoming the impact of the Ukraine crisis in distracting the United States from its pivot to Asia and from containing China to containing Russia. Russia’s tilt toward China as its strategic orientation is also welcome,6 as is the reinforcement being offered to China’s efforts to change the world order. Despite some Chinese restraint regarding a precedent for separatism in Tibet in Xinjiang, Russians appear confident that the way the Chinese view the confrontation with the West is very similar to how Russians perceive it. As Alexander Gabuev explains, Russia cannot fully compensate for losses from the West, even with China’s best intentions, whether credits, technology, or markets.8 Moreover, he observes, Russia’s elite is not clear on its strategic intentions toward Russia. Many think it wants to colonize Russia and get control over the resources of Siberia and the Russian Far East. Memories of the 1969 conflict and impressions of the rise of nationalism in China raise doubts that it may seek tight control over a weaker partner. Demographic factors, often filtered through the eyes of Westerners, fuel these concerns along with misinformation on how many Chinese are present now. The fact that Russia’s move into Crimea was triggered by the declaration led by an ethnic group of a people’s republic and its desire to unite with Russia leads some in conversations to suspect that China could do the same in parts of Russia’s east. Another risk is the absence of alternative Asian partners. As a result, Russia is obliged to select a variant that maximally ties it to China, depriving it of other options. Before the sanctions Japanese and South Korean entrepreneurs were discussing many projects, but now they have turned away or, at least, paused. With companies weakened by sanctions and zero-economic growth, those in need of proceeding can turn only to China. The Ministry for the Development of the Far East and the heads of administration in the region sought diversification before, but now only have China. Plans to develop infrastructure on the Pacific allowing multiple export destinations, such as Vladivostok SPG, are in turmoil, since the signing of the massive gas deal with China in May leaves supplies in doubt. Japan and South Korea could not provide necessary credits even if they wanted to make the purchases, fearing the US reaction. Russia has left itself in a market with a monopoly purchaser. Making the absence of diversification more dangerous are the distinct features of China’s legal culture, Gabuev adds. A classic example of this occurred in 2011 when the Chinese side lowered the price of oil being sent by pipeline by USD 10 per barrel, contending that lower transport expenses justified a lower price than for oil piped all the way to the port of Kozmino. When Rosneft and Transneft appealed, citing the fixed price in the contract for all oil on the pipeline, the Chinese court made it clear that the contract could be voided, requiring Russia to repay in cash the entire loan. After all, China could get by without the oil. In the end Russian companies were in luck because the Arab Spring and instability in the Middle East led China to decide that stable oil supplies by land (the only others coming from Kazakhstan) must be preserved and to agree to only a USD 1.50 a barrel discount at a loss to Russia of USD 3.5 billion over the course of the agreement. Another problem is the impossibility of securing financing in China on as favorable terms as in London and New York. Russian businessmen all complain about the tough stance of Chinese bankers, especially in long-term and complex transactions. Only the big Russian companies can count on a government guarantee. Because of sanctions and the caution of both bankers and investors in other Asian states, Chinese creditors are more advantaged. The anti-corruption campaign in China is shaking up the bank sector. In light of the ties of Zhou Yongkang, Xi’s opponent, to the energy sector, it and the banks that gave it credit are being scrutinized closely, leading to tougher conditions for new loans. Another problem is the longstanding conservatism of private funds in China with regard to investments in Russia. Aware of negative ratings for doing business in Russia and the 2009 precedent of billions lost to Chinese companies in the raid on Moscow’s Cherkizovskii market, Russians also face the exclusion of foreign firms from the Shanghai and Shenzhen stock markets and a bad reputation from a faulty initial public offering of Rusal aluminum in 2010 in the Hong Kong stock market. There is palpable fear that agreements in which Chinese insist on the use of Chinese technology on Russian soil will undercut Russian industry. There is fear for local automobile production, maintenance of the Russian gauge for railroads, a shift from Western telecommunications with built-in spyware to uncontrolled espionage by Chinese telecommunications, and copying and exporting with regard for intellectual property rights of no concern. Economic dependence appears fraught with dangers. The answer is that Russia must modernize its economy, making sure that it has the budgetary resources to spend on this, including on education and healthcare. Given that Russia is a nuclear power and the PLA already has at least achieved parity with Russian forces in the Far East, Russia needs to analyze the geopolitical risks, notes Gabuev, from the angle of concentrating funds on development. Attracting Chinese labor should be done under conditions that they return to China, following the positive example of construction workers for the 2011 APEC summit, and steps for effective border control. By identifying niches in the developing Chinese market, it would be possible to diversify Russian exports. The most obvious path is to grow the urban middle class, while opening fertile areas of Primorskii krai for food exports. In another recommendation, Gubaev calls for working with Japan and South Korea as well as the United States, playing on fears of close Sino-Russian relations, while also diversifying to Southeast Asia. To realize all of these goals it is necessary quickly to expand expertise on East Asia, including through deepening international higher education cooperation and integration of business in the process of preparing new experts. The final appeal is for farsighted policies to the region, which will retain its strategic significance for a future Russia even after accommodation with the West. Japan’s reliance on the United States is not conducive to a strategic breakthrough with Russia. Its economic promise for Russia falls far short of China’s. Also, its values do not resonate well in a country prioritizing the recovery of historic identities, not least the legacy of the Soviet Union. Yet, Japan’s quest for a diplomatic breakthrough in Asia and its obsession with recovering territory leaves an opening for Putin, who has found Abe Shnzo to be the ideal partner in keeping talks alive despite pressure. In October 2014, Iurii Raikov wrote optimistically of the surprising possibility of Russia and Japan achieving full-scale cooperation.10 Driving them are images of playing an active and important role in the history of Asia, but being relegated to a secondary role in relation to the United States and China and searching for a pathway to draw close to each other. Harsh geopolitical realities and internal quests are making them natural partners in East Asia, Raikov adds. Having failed in its attempt to establish a unipolar order, the United States has left a less manageable order, especially in the Asia-Pacific region, in which Russia and Japan both aspire to multipolarity. While praising China’s positive leadership role in the region, Raikov observes that it has narrowed Japan’s options, which is eager to restore its leading role in the economic integration and political process of the region. As a new cold war between China and the United States becomes increasingly evident and China’s military modernization gains in momentum, Japan has no choice but to stay close to its ally. Yet, it sees Russia as a vital partner in the struggle against Chinese hegemony and is casting aside existing problems between the two countries. Russia, Raikov explains, is a great power with vast resources and military potential, which could strongly tip the scales in regional affairs if it joined forces with one side or the other in East Asia. In addition, drawing close to it has advantages for Japan’s economy and its access to natural resources and energy in the competition with China and South Korea, Raikov notes. Moreover, it is a large market. Finally, it must preempt China, the United States, and a unified Korea from strengthening and can make use of a stronger Russia, boosted by the modernization of Siberia and the Russian Far East. This analysis presumes Russia’s great value to other countries and a fiercely competitive, zero-sum environment to its advantage. Japan is depicted as in need of Russia, not the other way around. Raikov explains that some analysts doubt that Japan is ready to play an active role in forging a new world order, but he finds many reasons why it will do so, notably its loss of confidence that the United States would defend it. As for Russia, he explains that its sole motives are economic—to attract Japanese investment, above all to the Russian Far East, and to avoid excessive dependence on China economically. Thus, there is no acknowledgment that balancing China or geopolitics matter for Russia. Drawing on recent distortions in Russian analysis, Raikov underestimates US power, overestimates Russia’s clout, and misunderstands Japan’s situation. Yet, he may be right that Abe, for whatever reason, is eager for a breakthrough with Putin and inclined to defy Obama. He goes too far in arguing that both seek a regional system of security, as if the US alliance framework is not dividing them. He exaggerates economic complementarity, as if Russia’s resources are vital to Japan, ignoring its slow economic growth, the fall in global demand for resources, and the inhospitable environment in Asiatic Russia apart from brief mention of Russia’s shortcomings. The main stress is on fear of China in Japan and Abe’s nationalism, which makes him in a rush to make a deal with Putin. On these points, Raikov may be correct. Unlike many Russian analyses, he acknowledges that a compromise on the territorial issue is required, parallel to the agreement made with China, which allows both sides not to lose face. The article concludes with concern about the impact of US pressure in regard to the Ukraine crisis, but it holds out hope that of the visit of Putin to Japan is put back on Japan’s schedule, then the optimistic scenario set forth can go forward. Abe’s revisionism requires not only a hard line to South Korea, but a break with the United States in identity and diplomacy, but not in the alliance. Yet, Putin’s defiance of the United States and the West and increasing closeness to China leaves in doubt what Abe can accomplish. The territorial compromise is likely to be no more than Japan was offered in the past. The economic benefits Russia offers are losing their value at a time of sanctions on Russia and energy abundance. The illusion of a new multipolar regional framework is exposed by the growing reality of bipolarity. The contradictions between Russia’s China and US policies and its aspirations for Japan are difficult to reconcile. A breakthrough with Japan is desired, but not a priority. Russia’s pivot has a geopolitical component, for which China is indispensable, a civilizational component, which counts heavily on China also, and an economic component, which depends mostly on China but faces uncertainty as a result of problems with China and lingering hopes that Japan and the Korean Peninsula can contribute to its goals, especially in the development of Siberia and the Russian Far East. Rejecting the West in all three respects, Russia has contradictory notions of joining China in a new cold war and forging a multipolar regional framework. Russia’s actions in Ukraine can resolve this contradiction, leading to more or less sanctions from the West and more or less need to rely overwhelmingly on China. A pivot in desperation without a strategy for attracting foreign investment is bound to leave Russia with no recourse but China, which, as seen in 2014, is driving a hard bargain. There is little prospect in courting North Korea with hopes for increased ties to South Korea and welcoming Japan’s advances with more demonization of the United States and endorsement of China’s merits. The door is closing on a strategy to maximize Russia’s leverage in the Asia-Pacific region and to develop the Russian Far East as anything but a resource appendage for China. Russian analytic thinking is too heavily censored and weighed down by today’s emotions to be strategic. The emptiness of Russia’s claims to be finding a home in Asia to compensate for its estrangement in Europe was on display in the November summits. Accomplishing little apart from the outline of another gas pipeline deal with China, Putin remained a marginal figure. In Beijing, Xi showcased unilateral Chinese moves—including the Silk Road Fund to be used largely in Central Asia, Russia’s backyard. In Brisbane the Western leaders treated Putin as a pariah. Despite talks with Xi and Park that left a ray of hope of renewed diplomacy, Putin was in the shadows as Modi and Widodo were being wooed, and Obama was demonstrating that the United States is back. 1. Gilbert Rozman, ed., Russia and East Asia: The 21st Century Security Environment (Armonk, NY: M.E. Sharpe, 1999). 2. Editorial Staff, “Country Report: Japan,” The Asan Forum Vol. 2, No. 5 (September 2014). 3. Editorial Staff, “Country Report: Russia,” The Asan Forum Vol. 2, No. 5 (September 2014). 4. Georgii Toloraya, “Russia-North Korea Economic Ties Gain Traction,” 38 North, November 7, 2014. 6. Vladimir Petrovskii, “Rossiia i Vostochnaia Aziia v kontekste ukrainskogo krizisa: ‘net’ sanktsiiam, ‘da’ novomu miroporiadku, ” Mezhdunarodnaia zhizn’, October 2014. 8. Aleksandr Gabuev, Rossiia v global’noi politike, November 2014. 9. Sankei shimbun, October 18, 2014, 5. 10. Iurii Raikov, “Rossiia—Iaponiia: tiaga k sotrudnichestvu,” Mezhdunarodnaia zhizn’, Oct.ober 2014.